Pacurar as a performer of traditional Romanian and Jewish music. Tonights concert at the Globe, however, will be quite different. 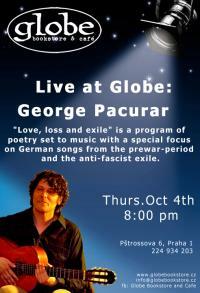 German songs from the prewar-period and the anti-fascist exile. Ibáňez, Wolf Biermann, Georges Brassens and the performer himself. Spanish, English and other languages, too.